1. It looks like the Nats have a decent shot at doing better than their last year’s record. The Nats would need to finish 14-17 in their last 31 games to pick up a better record, and if they play Jekyll and Hyde like they have been, that’s a fair bet. 2. But let’s not hope too hard. 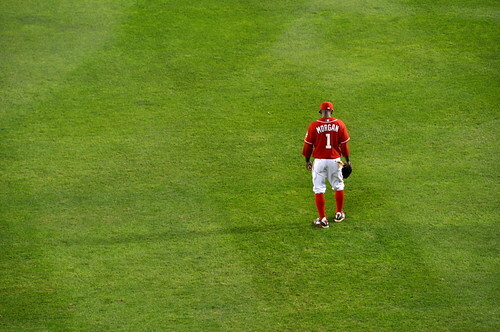 If the Nats finish last in MLB this year, they’ll have a good shot at Bryce Harper in the 2010 Amateur Draft. He hit the longest home run in Tropicana Field’s history at 502 feet. He did it at age 16. And he’ll most likely be in the draft this coming year, which means the Nats would have a shot at the kind of hitter you only see once or twice in a generation. 3. Stephen Strasburg’s down at Viera working out with the Instructional League team. His next stop after this will be Fall Ball in Phoenix Arizona come October. Place: Tied for first and last in the East. A win and a loss for the Skins in the last two weeks, and the loss was a fairly close one against the Patriots. In fact, 350-lb Albert Haynesworth did some quality work against the Patriots, including putting Tom Brady so far into the ground he left the game with a sore shoulder. Quarterback Jason Campbelll went touchdown for touchdown with Brady, in what ended up in a 17-17 draw in a battle of wills. The difference in the game ended up being Suisham’s missed 52-yard Field Goal in the 4th Quarter. The Redskins face one more test before their September 13th opener at the Meadowlands against the Giants. Thursday night they’ll be in Jacksonville against the Jags. One big win against Chicago on Saturday night erased a lot of the last two weeks’ doubt. A tie against the Galaxy that should’ve been a win, a pair of disastrous CONCACAF losses, it’s been a rough patch for United, but Saturday’s game was a change. Despite their horrific road record, they headed into Chicago with something to prove and came out with the a victory. Just ten minutes into the game, a free kick to the far corner was headed in by defender Brian Namoff, and that was all she wrote. Sadly, that’ll be the focus of a lot of the attention as the victory was desperately necessary. What may be overlooked would be the conflict between keeper Josh Wicks and defenseman Marc Burch, the two of which got into a heated argument late in the game and had to be separated. United has a big game this week, the US Open Cup Championship here in DC, and there’s a lot at stake for United, who’ve put a pretty strong foot forward in their marketing. Their campaign, “We Win Trophies”, showed up at Qwest Field in Seattle this weekend for the Sounders game, showing off DC’s pride in their team. Tickets for the game on Wednesday night are just $12 in the lower bowl, and $2 beers and $2 hotdogs are hard to beat. So click that banner to your right and head out for a good time at RFK. That was a rough road trip. Four games out west came with just one win, but that was enough, coupled with a win over the Lynx last night to keep the Mystics in the middle of the hunt. Just five games left in the regular season, and they’ll need to win three of them if they want to push ahead of the logjam. It’ll be tough with trips to Chicago & Indiana, but they ought to be able to take out New York, so that means finding two wins against the other four. Two of those games are at home, so let’s pack the Phone Booth on Thursday and next Saturday for games against Seattle and Atlanta to see if we can’t get the Mystics into the Playoffs.